President Moon Jae-in on Thursday said he would use all of his 21 annual paid leave days and encourage his subordinates to use theirs as well. 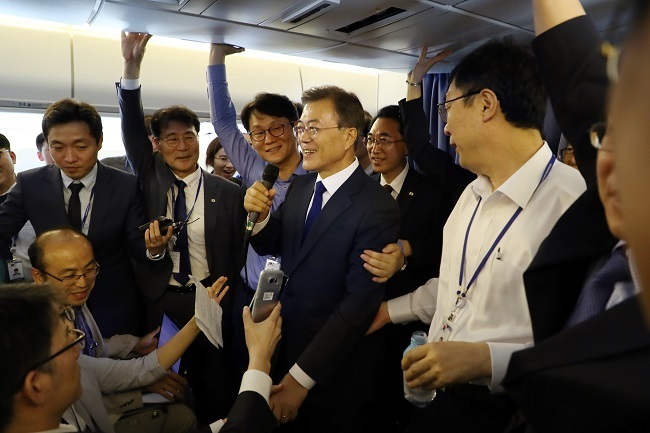 On his flight to Washington for his first overseas trip as president, Moon told a group of journalists that he wants to make it mandatory for other workers in South Korea to use their time off, stressing the importance of kicking back. South Korea’s former presidents have rarely taken vacations longer than a week. Moon has already taken a day off to rest at his private residence in Yangsan, South Gyeongsang Province, on May 22, 12 days after his inauguration. During his election campaign, Moon vowed to tackle the local working culture that hinders the full usage of paid leave. “Good resting is a national competency. I will revise laws to obligate workers to receive at least 12 days of summer holidays and will also review extending paid leave from the current level of 15 to 20 days” per year, he said then. Taking all stipulated paid leave would also lead to economic benefits of 20 trillion won ($19.3 billion) and additional employment of 380,000 citizens, Moon asserted. In an online survey released Thursday, more than 38 percent of 1,171 workers polled said they worry about what their bosses or co-workers think about them taking paid time off.